Mark Fuhrmann is Partner in Blue-C, an Oslo-based strategic marketing and communications firm that is a ubiquitous presence in the world of maritime. 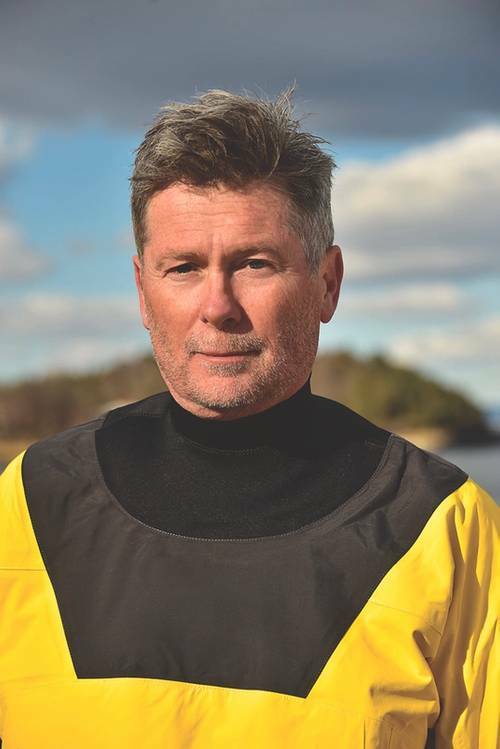 Fuhrmann recently embarked on a 5,400 km solo kayak paddle from Oslo to Athens to raise money and awareness for “The Piece Prize” a charity he created, which, for lack of a better description, is aiming on making the world a better place. Well, that’s a long story. I was born and raised Canadian and I studied communication and journalism in LA. I met a girl there, got married in Norway and had three lovely children. My wife died of brain cancer five years ago. I’m always moving forward, and I’ve always thought I could do things, even though many were beyond my intellectual and personal ability. At the age of 12 I saw some guys jumping off a diving board and I thought ‘I can do that.’ I did, but then I quickly discovered that there was no bottom and I couldn’t swim. (That would be Shasta Lake outside of Bellingham, Wash.). I guess jumping into the unknown has always been with me. I’ve started five businesses and just got on with it. I am not an analytical person; I’m a doer. I see something, I reach for it and I achieve it. The real me: perhaps I always want the best and in wanting the best I sometimes fail to make decisions that need to be made. I hate firing people; I love hiring people. I strongly believe the world is one place, one people group, one humanity, one responsibility. Cultures and ignorance separate us, as well as wealth, opportunity and acceptance. You are set to take a break from the daily routine and embark on a personal mission. What exactly is “The Piece Prize,” and what inspired you to create it? The Piece Prize is a humanitarian award to recognize individuals/organizations which are actively involved in making neighborhoods, communities and cities a peaceful place through acts of genuine kindness and caring. What inspired me? An old lady in a house. See: https://youtu.be/Ab49oxEFuGA. In short, what is the objective of this mission? To inspire individuals to make a difference in their local communities and cities; to foster mutual respect for one another, regardless of faith, traditions and cultures; and to generate a 21st century mindset that a peaceful world starts with “me” and requires the effort of many individuals. We live in a divided world, with complex political, cultural, ethnic and religious situations. I think that the shared sense of community is at risk, ultimately a threat to civil society. This requires action, not only by governments and global charitable organizations, but by individuals. So what, exactly, is the journey you’re preparing to take? How have you trained for the physical and mental rigors of this journey? Good question! I have paddled for 15 years, but my kayaking skills are intermediate, but I will not paddle more than 900 meters from shore, maybe further out if the waters are calmer. I started jogging, I row at a training center and I have done a bit of yoga. I am not a hardened explorer type. I have no idea what is ahead. I have no idea of what it is like to cross a channel of water or paddle alongside a barge on a canal, but I guess I will find out. What advice would you give to others who might be planning similar endeavors? Ask me when I am finished. If our readers want to get involved, how can they do so? Yes. There is a donation tag at www.thepieceprize.com. All international donations will in their entirety (less bank or visa costs) go to one of several causes. Track Mark’s journey at https://locatoweb.com/en/map/single/223297059.